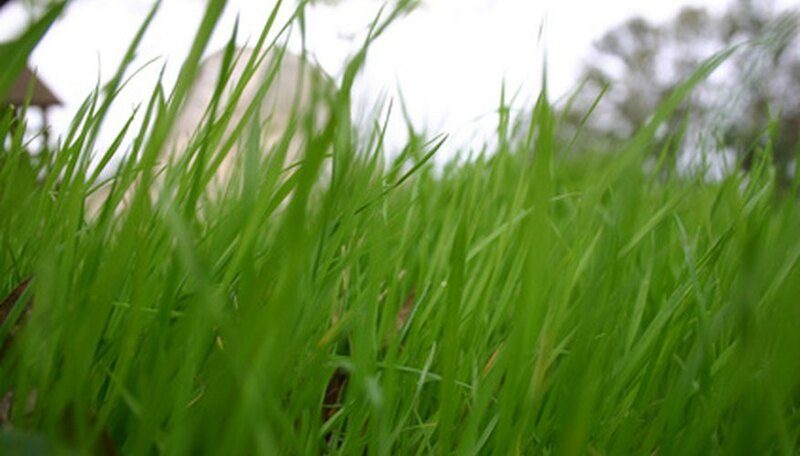 The most common type of grass grown in central Ohio is Kentucky Bluegrass. This is a sun-loving, cool weather turf grass will stand up well in play areas and offers good fall color. The best time to plant lawn grass seed in central Ohio, according to agriculturists at Ohio State University, is Aug. 15 to Sept.15. Since central Ohio lies within USDA Hardiness Zones 5a and 5b, the recommended spring planting date for grass seed is a bit later than that for southern Ohio, which is after May 15. Use 2 to 3 lbs. of grass seed of per 1,000 square feet of lawn area. Deliver a soil sample to your county’s Ohio State University Extension office for analysis. As of 2010 there is a $12.00 fee for this service but the results are invaluable. The lab requires samples from several different areas of the planting bed. Dig into the planting area 3 inches and scoop out 1/2 cup of soil in five different areas. Dry the samples in the sun, mix them together and either mail or deliver them to the extension office. Rototill the planting bed to a depth of 12 inches. Remove any old roots, rocks or other debris that surfaced during tilling. Add soil amendments according to the recommendations of the Ohio State University Extension agent. Amendments may include many items such as compost, lime and sand. Mix the additions into the soil to a depth of 6 inches. Roll the planting area enough to gently pack down the soil. Add 1-2-1 or lawn starter fertilizer at the rate indicated on the fertilizer package for the size of your planting area. Rake the fertilizer in to the top 2 inches of soil and then level the area until it is smooth. Pour half the grass seed into the broadcast spreader and sow it in a north to south direction. Add the remaining grass to the spreader and sow it at a 90 degree angle to the first seeding. Rake the planting bed lightly so that the seed is just barely covered. Water the area until it is wet but not saturated. Water two times per day until the new lawn is established, then give the lawn 1 inch of water, slowly, per week. In central Ohio it is especially important to keep an eye on the moisture content of the soil in July and August and provide extra water if necessary.